British band Radiohead are said to be "shattered" by the death of their "friend and colleague" Scott Johnson, who was killed when a stage collapsed before their show in Toronto, Canada. The 33-year-old drum technician, from Doncaster, South Yorkshire, was setting up for the band on Saturday when the top part of the stage fell on him. Mr Johnson had worked for other British bands, including Keane and White Lies. 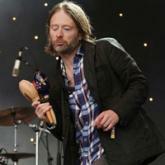 "We will miss him very much," said Radiohead's drummer Phil Selway. "He was a lovely man, always positive, supportive and funny," he went on in a statement on the band's website. "He was a highly skilled and valued member of our great road crew. "Our thoughts and love are with Scott's family and all those close to him." Keane joined the tributes to their "great friend Scott Johnson" in a message posted on their website on Monday. "He saw the good in everything," wrote the East Sussex band of Johnson, part of their "touring family" since 2004. "He was the cheerful, dependable guy you could always turn to, who lifted the spirits of everyone around him. We can't believe he's gone." Other musicians have been remembering Johnson on Twitter, among them White Lies drummer Jack Lawrence Brown. "Scott worked with White Lies on a show earlier in the year as my drum tech," he wrote on Twitter. "A very talented man and a lovely guy all round. Glad to have known him. A big loss. RIP Scott." Richard Jupp, drummer with Manchester band Elbow, tweeted: "RIP Scott Johnson. Lost a great mate and true pro. A kinder bloke you could not meet." Portishead's Geoff Barrow wrote: "Shocking to hear the passing of crew member Scott Johnson of the Radiohead tour. My thoughts and condolences are with everyone involved." The Charlatans' frontman Tim Burgess called the death "tragic", adding: "Our thoughts are with the family of Scott Johnson." Ian West, Mr Johnson's drum teacher in Doncaster, also paid tribute to his former pupil, calling him "a great student and a great drummer". "He got a lucky break and made the most of it, he never looked back," said West. Three other crew members were injured in the accident, two of which were treated at the scene. According to Toronto Police spokesman Tony Vella, the condition of a third man who was hospitalised with a head injury is improving. A team of inspectors and engineers from the Ontario Ministry of Labour have begun searching through the wreckage to try and establish what caused the stage to collapse. Ministry spokesman Matt Blajer said the massive structure is "still fairly unstable" and that work was underway to make it safe. The collapse happened an hour before the Oxfordshire band were due on stage, with Radiohead fans already beginning to queue outside. The sell-out concert was cancelled due to what were described as "unforeseen circumstances". Ministry spokesman Blajer said the investigation is "fairly complex" and it could take some time to figure out exactly what happened. Contrary to early speculation, there were no strong gusts of wind at the time the stage collapsed. Authorities are also investigating whether safety regulations and standards were followed and if staff were properly trained. Tony Bellavance, Fire Services Platoon Chief in Toronto, said officials were alerted to a person trapped under the wreckage and crews assisted in extracting the victim. "It was a crushing injury that killed the man," he said. Jason Ip, a food vendor, said there was "chaos" as people waited for the emergency services to arrive. "A few people started running towards the stage. No one knew exactly what had happened, but it was clear that people were underneath the stage," he said. "It was like witnessing a car accident. In a situation like that, you just aren't sure how to react." Around 40,000 people were expected for the sold-out gig, which was also due to feature Canadian musician Caribou.